Model Rules of Professional Conduct provide legal professionals with guidance in respectable practice, proper client relations, and how to navigate ethical grey areas. 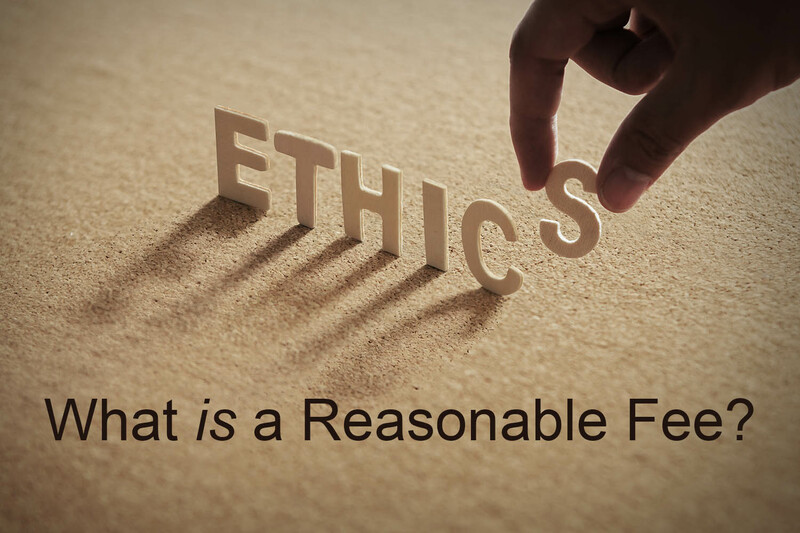 Ethics are synonymous with morals and morals relate to what is right or wrong. In the legal profession, it is an attorney’s job to advocate a legal position on behalf of their client. Navigating this advocacy can sometimes be complicated. This is why a compilation of a uniform set of guiding principle for ethical conduct in the legal profession is important. Each state has adopted a form of professional conduct rules based on the American Bar Association’s Model Rules of Professional Conduct. Some states have modified the cookie cutter example to fit the needs of their particular geographical requirements. Lawyers struggling with ethical dilemmas can turn to this text for guidance on what action they should or should not take. Attorneys regularly face challenging questions of whether they are competent enough for the task, who their client is, whether conflicts should preclude them from representing a client, defining the line between advocacy and overzealousness, and of course appropriate fees. Questions regarding the reasonableness of an attorney’s fees are a common cause of distress. Some lawyers may worry that they are charging clients too much for their services, while others might find that their services were worth more. How can counsel truly know that their fee is reasonable? In short, they cannot be certain – but, there are ways to assure one that what they are charging is justifiable under the circumstances. In the second case, Crandall was retained by Anthony when his mother died, to handle her probate estate. The home was virtually all that comprised the probate estate, valued at $70,000. Anthony’s mother had executed two different deeds before her passing. If enforced, the first would pass the property to her daughters. The second, to a trust. Crandall filed a petition in the case in September 2007. For unknown reasons, the next action in the case was not taken until March 2009, when Anthony died. At that time, Crandall petitioned for attorney fees and expenses and moved to withdraw from the case. However, Anthony’s brother retained Crandall in the case, to represent him as successor executor of the estate. After Crandall filed the March 2009 paperwork with the court to move forward with the representation, nothing else happened in the case until August 2011. Under Kansas statutes, an estate must be settled within 9 months of the appointment of an executor. The court was not pleased with Crandall, noting that in the many years that Crandall worked on the case, he did not request an extension of time once. In the end, the home was worth almost half of its original value. Crandall requested that the court approve $16,388.32 in fees in the case. The court approved $3,293.56 and referred the case for disciplinary action. In this particular elder law planning case, the court found that the lawyer did not have an unusual or atypical case to complete, nor was it too complex to justify spending an unreasonable amount of time on it. The lawyer was perfectly capable of handling the case; the case was routine in nature. Regarding the lawyer’s probate case, the court found that there was nothing overly complex about the case – other than questions of the validity of multiple deeds for the home. The lawyer did little in the seven years he was retained as counsel on the case. The court instead found that any complexities were a result of Crandall’s interest in shifting the home into the estate to ensure payment of his fees, rather than to keep the asset out of probate for the benefit of the decedent’s children. Additionally, Crandall charged the client for inappropriate billings – such as clerical work, time and fees for requesting withdraw from the case, and fees for time spent on self-created delays from dragging his feet on the matter. The elder law planning case was relatively straightforward; there was little to suggest that taking on this case would preclude Crandall from taking on other cases as he completed his services. However, he did insist that there was a three-year period of representation following the completion of services, had any problems arisen, which could potentially limit his future ability to represent other clients. The court found nothing novel about the probate case – given its small size and minimal familial complications. This case did not create any limits on the lawyer accepting other employment while handling the case. In the elder law planning case, the typical charge for such work in the area was between $3,000 and $8,000, per the testimony of another attorney in the area. Crandall charged roughly $30,000. The lawyer attempted to justify this cost as part of the three-year post-representation services and a dispute between the children of his clients. While the court in the probate case found that the lawyer’s hourly rates were customary for the area, the final billed amount was excessive given the size of the estate – here, roughly half of the final amount of the estate. Additionally, it was noted that the estate would not have been worth any such amount had the lawyer not pushed to have the home included as part of the estate, rather than pursuing the opportunity to establish a homestead claim. During Crandall’s seven-year representation on the probate case, the value of the home, as the sole source for eventual payment for his services, diminished to half of its original value. Crandall and his clients would have been better served by timely completing the probate matter. There was no dispute as to any rush imposed on the lawyer for the elder law plan. While the client in the probate case did not impose any time limitations on the lawyer, this case crept on for over seven years. Crandall blamed the client pushing for the homestead exemption and ignoring his emails. Despite the fact that Crandall admitted that his client consistently returned or answered phone calls, Crandall opted to continue undertaking unanswered electronic communications. The elder law plan was successfully executed within a short amount of time. Crandall’s representation in the probate case was undisputedly limited to this singular matter, but was not completed for more than seven years. Crandall did not present any reputation or experience evidence to justify higher fees in the elder law planning case, other than his own testimony. Again, Crandall presented no other reputation testimony regarding the justification for his fees in the probate case, other than his own testimony. Despite confusion on what basis the lawyer used to calculate his fees, the panel determined that his fees were on a fixed basis. It was determined that the fees charged in the probate case were calculated by the hour. This particular lawyer, and his actions, is an example of unethically overcharging fees. However, it is not always so clear. It can be challenging to determine if a lawyer’s fees are reasonable until the representation comes to an end. Fees charged along the way are often easy to justify, but may be questionable from a holistic view at the representation’s conclusion. A reasonable interpretation of this particular case comes down to common sense. If attorney fees result in commandeering half of a decedent’s estate, those fees are likely unreasonable. If an attorney’s interest in having available funds in the estate to secure his payment is prioritized over the well-being of his client, that lawyer is acting unreasonably and in opposition to ethical standards. If an attorney has to make up justifications for how much his client will save as a determinative factor on what the lawyer is owed, his actions may be unreasonable. Every attorney deserves to be compensated for the work they do for their clients. Clients are oftentimes in a submissive or vulnerable state when they seek an attorney’s help. This is why they come to a lawyer – for expertise, knowledge, and a commitment to their well-being. A client’s own attorney should never be the origin of their exploitation. If a lawyer cannot logically justify what he is charging a client, then it is time to reconsider what is justifiable. Remember – clients that feel that they are treated fairly are more likely to return for future services or to refer others to the firm. Elder law is a practice area that offers great potential and reward but sometimes it's difficult to know what to charge. 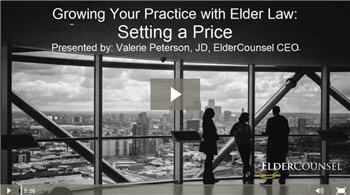 Watch this 5 minute video from "Growing Your Practice with Elder Law" and hear ElderCounsel CEO Valerie Peterson discusses different pricing strategies.